Much like the low-carb diets, the Paleo diet will leave you craving sugars. Candy, bread, alcohol, and sodas will all be on your mind when you first begin this diet. Be sure to stock up on fruit! Calcium and Vitamin D. This one is no surprise. Dairy is the primary source of calcium, so if you eliminate dairy from your diet, you will have a harder time getting what you need. Milk is not part of an ‘authentic’ Paleo diet. In the Paleolithic era, breast milk was consumed at infancy and served no other purpose. Dairy is a huge source of calcium today, especially in the average American diet. Recommended Products: Vitamin D & Osteo-CalMag. Magnesium. If you think about it, when it comes to whole foods, calcium and magnesium often come bundled together. So, if you are low on calcium, magnesium often follows. Recommended Products: Osteo-CalMag. Folate. Women who are pregnant or are planning on getting pregnant soon should not neglect this one. In fact, nobody should, but especially women in child-bearing years. Recommended Products: Folacin. Iron. Shocking, right? How could a diet high in animal source foods be low in iron? Well for starters, not all animal food sources are high in iron. A third of a pound of game meat like that from a bear will provide 100% of your iron for the day, but it would take 1.5 pounds of lean ground beef to get that much. Then there’s poultry, which would require 3.8 pounds of skinless chicken breasts. Almost 4 pounds! I hope you’re hungry. Recommended Products: Iron. Omega-3 & 6. While a Paleo diet is high in essential fatty acids, it is low in 3 and 6, unless you are eating a lot of fish. Recommended Product: Omega. While the Paleo Diet takes second place to the Mediterranean Diet in overall nutrition, it certainly takes first place in overall popularity. Efficient marketing campaigns have cemented it as the diet of choice for many, which means that many are lacking in key nutrients. 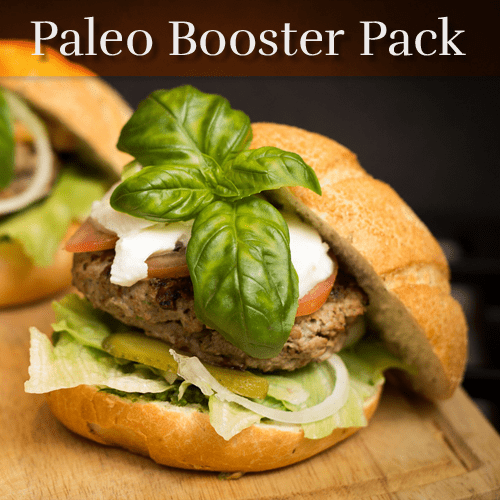 VitaMist has the fix, with the Paleo Diet Booster Pack. This pack contains Vitamin D, Osteo-CalMag, Folacin, Iron, and Omega. Everything you need to be the healthiest caveman ever, for 20% off the cost of purchasing each product individually.